I have been looking forward to the American Library Association conference because going to ALA is always a blast. But not being an actual librarian needing to go to actual meetings, I can rarely justify crossing the country to attend. But — hello? — when it’s in my backyard, then of course I’m going to be there. Still better this year was the collection of authors and illustrators winning awards, because lots of those were kidlitosphere folk. And I was giving my first big presentation. And I was going to the Newbery/Caldecott dinner. A recipe for a perfect weekend. But let’s start back at the beginning. I missed the Friday evening activities — including the Kid Lit Drink Night — to attend my tween’s dance recital. She had another one on Saturday morning where she was singing as well as dancing, so my Saturday ALA experience started off slowly. I went to the convention center to pick up my badge, and decided I had time for three quick book signings — as opposed to the ten I’d listed on my Saturday plan. I was in time to get a copy of The Night Fairy, by Laura Amy Schlitz. I have the ARC and loved the book, but was excited to get the copy with full color illustrations. There I ran into Betsy Bird — on crutches from her earlier ankle injury. 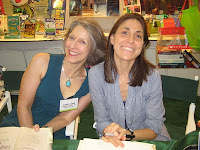 I had meant to bring Kate Messner’s book The Brilliant Fall of Gianna Z. with me, but was pleased to find that I could get an ARC of Sugar and Ice signed by her. It was a pleasure to meet someone that I’ve only seen online. My highest priority signing of the day was of When You Reach Me, by Rebecca Stead. 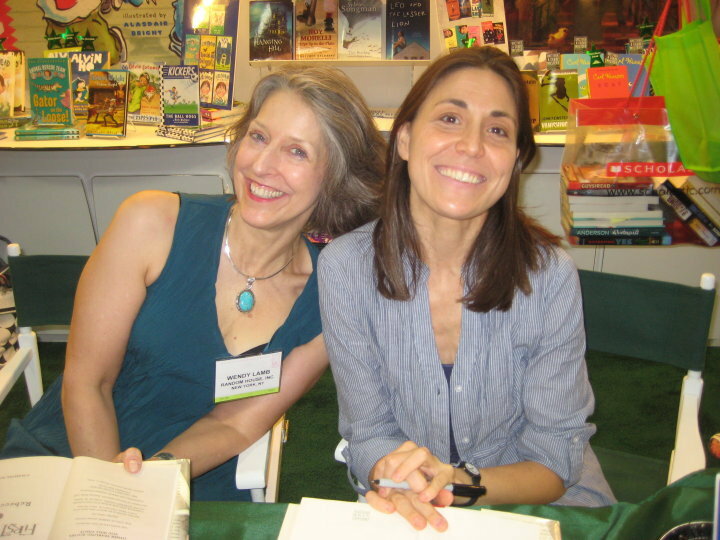 I had met Rebecca at a NYC Kid Lit Drink Night years ago, and we had such a great conversation. I was more than happy to read and review her debut book, First Light. At another NYC trip, another Kid Lit Drink Night, we talked about her upcoming book — which turned out to be this Newbery Winner. I couldn’t be happier for this honor to go to such a wonderful person, and I wanted to make sure I saw her at her signing because I knew that she would be one busy lady during the conference. And indeed, I never saw her again. I mean, other than on stage accepting her medal. Yeah! After that very brief time at the convention hall, I went to the lovely home of Tami Lewis Brown, where she was hosting a tea for Children’s Literature Ambassador Katherine Paterson. As soon as I entered the party outside, I found myself in conversation with Mrs. Paterson and M. T. Anderson. I don’t remember what we talked about, but it wasn’t fangirl gushing. I was in a prime placement for people arriving to the party, so I was able to give lots of hugs as my kidlitosphere friends arrived. At some point I circulated away, so as not to dominate the coveted space around both Katherine Paterson and M.T. Anderson. I do try to be good. 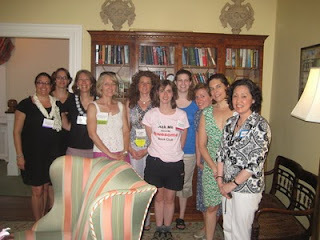 I’m not sure how I can even list all the authors and kidlit bloggers that I saw during those couple of hours. The guest list could have been plucked from my Facebook friends — which was the coolest thing ever. One big highlight was meeting Grace Lin for the first time in person. I’ve commented on her blog and reviewed her books for years. I gushed so much love for Where the Mountain Meets the Moon that I should have been collecting kickbacks. To meet her for real was simply wonderful, and the sweetness that rings through in her blogs and books was just as evident in her face. While some bloggers headed out to a quiet dinner together, I went home to regroup for the big day on Sunday. A day that would start with my presentation at eight flippin’ o’clock in the morning and would end with the Newbery/Caldecott dinner. It's been so great to hear about all the experiences from ALA! I have to admit, I'm pretty jealous, especially of meeting Katherine Paterson! It was really wonderful to meet you, Pam! !